Just as there’s no such thing as a “standard” video, there’s no such thing as a “standard” shoot. Locations, subjects, lighting, sound, tone of voice and style all vary tremendously from project to project, meaning we have to be prepared for anything and everything. 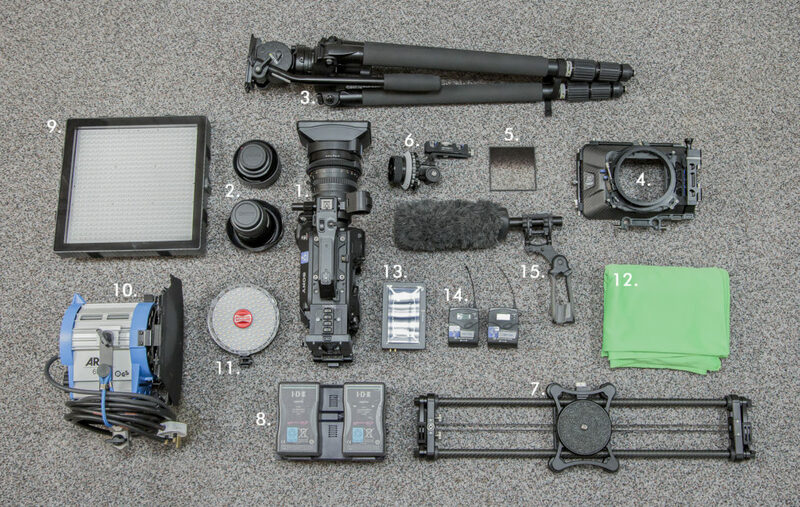 So when you hire our video production team for a day, what camera kit can you expect them to bring along? Our standard camera shoots in 4K or HD, and gives a number of options such as shooting slow mo, timelapse, and s-log to give a high dynamic range for a super detailed, grade-able image. See Philip Bloom’s review, here. We also have a DSLR camera kit for super lightweight shoots, and Sony PMW EX3 cameras which are perfect for conferences and seminars. We have a selection of lenses to choose from, including the standard ENG-style zoom lens, wide-angle and telephoto zooms, and prime lenses. As any photographer will tell you, the lens is probably more important than the camera, so we choose high-quality, fast lenses to ensure all the light hitting that 4k camera sensor is as beautiful as possible. From lightweight, carbon fibre, to sturdier steel versions, we have a tripod suitable for every job, with fluid heads for smooth camera movement. To ensure there’s no extra bits of light sneaking into the lens, we provide a mattebox with top and side flags, and 2 filter trays to carry…. Grads, polarisers, diffusion and colours are all in our camera kit bag, giving the camera operator the option of getting creative on set. Sometimes our subjects don’t stay still, so to ensure the image remains pin-sharp in all the right areas, we provide a follow focus unit. Sometimes if we’re feeling creative, we don’t want our camera to stay still either, so we can go handheld, or provide grips like the slider pictured here, which enables smooth camera movement, either by hand, or using the built-in motor. Cameras, monitors and lighting all require power, and sometimes there isn’t a plug socket nearby. We try to ensure that we have long-lasting batteries for everything that could be powered this way – it also reduces the number of cables being stretched across the floor. LED lights are dimmable and colour changing, which means we can adjust our panel lights to match any existing light. They provide a lovely soft light which is ideal for interviews or balancing out high contrast natural light outdoors. They also run on batteries or mains. We provide a 3-head lighting kit for every shoot, ensuring your interviews & video productions are perfectly lit. We also have a Chimera soft-box for converting the hard, focussed Fresnel beam into a large, soft keylight. We’ve invested in the Rotolight Neo as an adaptable, portable camera-mounted light, for those interviews and vox pops where speed is of the essence. We have White, Black or Chroma-Green backgrounds which are ideal when your location background is less than ideal. Choose whatever background you want! We can provide small, portable monitors, or large static monitors to enable our clients to see what’s being shot. Audio is always the most tricky part of any production to get right, so we provide good quality radio mics, which are ideal for situations when cabled microphones are not suitable. Normally seen dangling from the end of a long boom pole, and usually known as “that furry thing on a stick”, we use high quality Sennheiser gun mics to provide clear, balanced audio for your production. Of course, we can supply more kit than this – Steadicam, dolly & track, drone / octocopter, vision / audio mixing desks, extensive lighting, and any other camera you can suggest, but these would carry an extra cost. And if you’re a bit of a kit geek, you’ll be glad to know we’ll be looking at some of these pieces of equipment in closer detail throughout 2016 in our product reviews.